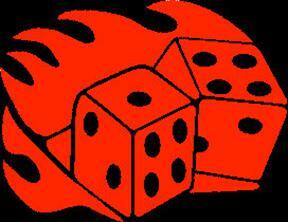 I've searched the far flung corners of the World Wide Web for flaming dice products. From jewelry to boxer shorts, lighters and even band aids, this wildly popular graphic decorates a variety of items. I'll keep updating the page to share these cool products with other dice fans. Interested in tattoo designs? 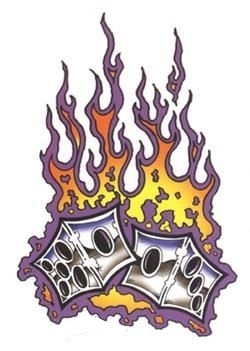 Tattoos of dice in flames are popular. Search for tattoos or roll on over to the All-About-Dice tattoo page for more information. 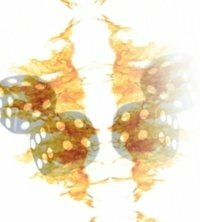 For those interested in drawing, check out free instructions on how to draw your own flaming dice. You may also enjoy a an airbrush stencil for airbrush tattoos. Stash your stuff in a black cloth drawstring bag with flaming dice. I hope this info helps you find what you're looking for. If not, please look at my recommendations of sites to visit in your search to buy similar products. The lasting popularity of this image means that you can find everything from a black flaming logo barbell tongue ring to earring studs, and a dice pendant necklace. There is also pendant earrings with your choice of colored flames, either orange or blue. Don't let your wrists or belly button get jealous. There's jewelry for those parts too. Check out a very cool ruby red gem dice dangle belly ring or a wicked pewter rocker bracelet with the a dice-in-flames design. Whether you're an adult or a child, male or female, you can proudly own clothes and accessories decorated with dice. I've tracked down some cool shirts, head wear, belts and buckles plus a few other items. Let's discuss the clothing for women and children first. Baby can stroll with Mom and Dad in style with a white dice onesie or a black dice onesie adorned with dice on fire. Women can sport a black t-shirt with flames and dice. A rockabilly-style black leather belt (not just a buckle) with dice on fire would look cool too. Finally, complete your wardrobe with stylin' red dice on fire socks! 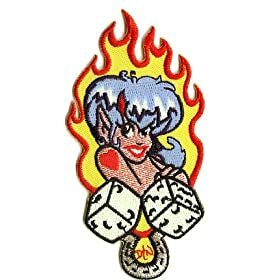 I may be stretching the "clothing" category a bit, but I've got to tell you about these band aids with flames and dice! After all, you do wear band aids on your body. Cuts and scrapes never looked so cool, I guarantee you that. 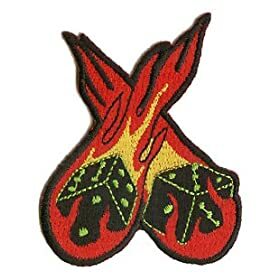 Clothiers must know men love dice and flames. That would explain the great choices out there for shirts. A dice club shirt in black will have you looking good while gambling at the Hard Rock Casino in Vegas or chillin' at the bar with friends. There's a stylish casino shirt with dice with short sleeves too. A long sleeved black t-shirt provides a casual and cool look. If you've got some good biceps or tattoos to show off (or it is just very hot), then pull on a short sleeved dice in flames t-shirt. You can cover your head with a head wrap with dice in flames, a good option to wear under your motorcycle helmet, hat or by itself. A knit cap provides another stylish head wear option, especially in colder weather. Maybe the presence of flames on the knit cap will be enough to induce warm thoughts. It is worth a try, right? Do you want to be more discreet? After all, flaming dice aren't standard attire in corporate America; well, unless you work at Google or Zappos. These black dice boxer shorts with flames qualify as discreet attire, unless you're walking around the office without pants. Also, while not discreet (let's say subtle), these dice wristbands are a fun extra for your wardrobe. Turning to the exact opposite of discreet, say hello to the neckties! You can wear your style around your neck. Ties are a great way to revel in self expression. Roberto Celini created a fun, stylish hot dice tie to add an exclamation point to any suit. Don't forget the ultimate pants accessory...a rockin' belt buckle. A flamin' dice belt buckle is a good choice. If you're carrying around cash (from your dice game winnings of course), then a stainless steel money clip with dice in flames will be a strong, durable clip to keep it together for you without costing you a lot of bills. Hot rods and flames go together like carnivals and cotton candy. Flaming dice? Even better. Most of us don't own a hot rod, but we'd sure jump at the chance to add a little style or personality to our ride. Short of painting flames on the hood, let's take a look at what's available. First, customize your interior with a gennie dice gear shift knob that will fit both cars and trucks. Did you know you can have a fresh smelling car AND maintain a cool persona? You just need an air freshener with dice in flames. Ahhh...fresh air! Of course, fuzzy dice with flames represent the ultimate accessory for your rear view mirror. Flaming dice on stickers can be combined with other objects, people or animals. One of my favorites shows a black cat standing on dice. However, they also hold their own just fine as a popular sticker choice. You can find this sticker below at Cool Chaos. Your garage or man cave needs a neon dice clock. You know that, right? That's one of several hip flaming products in this category. Let's take a look at more. This one is for the ladies...a cherry dice compact mirror. This next one surprised me. How would you like a dice in flames key? Yes, an actual metallic key. Click on the link to see it for yourself. "Need a light?" Offer someone a flame with a black Zippo dice lighter . Guitar players rejoice! There's a black leather guitar strap emblazoned with fire dice. You can strap it on and jam away. If your search continues for flaming dice products, I'd suggest visiting these sites. I discovered that they offer a good selection of dice-themed products (flaming and non-flaming) and you may find what you're after.